Fall is here! These are five must-do activities to kick off this season the right way! These easy and affordable festivities are sure to help you and your friends enhance this beautiful season. As the air starts to chill, what better to drink than a hot pumpkin spice latte? While holding your drink full of warm flavors of autumn, your hands are guaranteed a thermal safe haven. What a fun way to pass time. All you need is a few pals and your cell phone to make this work! The red, gold, and brown color of the leaves will ensure a beautiful artsy backdrop for a photo shoot. Nothing is more satisfying than hearing the crunch of leaves under your feet. 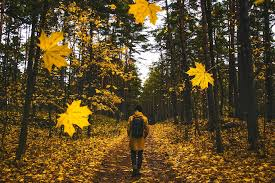 The smell of fall leaves filling your lungs will put your mind at ease. It’s the perfect way to get some physical activity in and allow your body to experience relaxation at the same time. As the seasons change, it can be fun to change up your environment, too! Go get yourself some new candles! Imagine sitting in your room with the sweet scent of a pumpkin spice candle hanging in the stratosphere. Now that sounds nice. A good excuse to get all your friends under the same roof is to plan a Friendsgiving. There’s nothing better than good friends and good food. They go hand in hand. Getting together with the ones you care about just for the heck of it is the recipe for a great time. Be sure to try these out! May your fall be filled with endless fun!! Yes! Love these fall must-do’s!! !